« Who knew LSU coach Les Miles had rhythm? We now know that at least one person has been touched by the Legendary Pictures film, “42,” the story of baseball legend, Jackie Robinson. 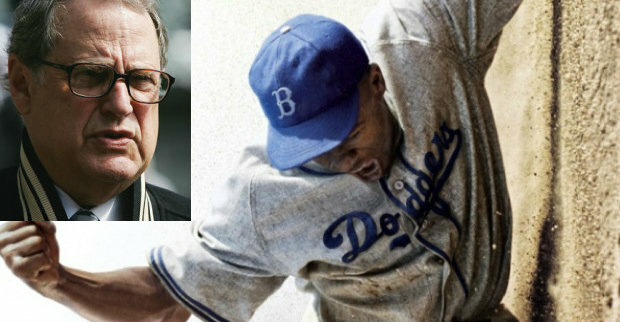 Jerry Reinsdorf, owner of the Chicago White Sox and Chicago Bulls, was present at a private screening of the movie in Arizona Wednesday night and he had some interesting things to say to the Chicago Tribune about growing up in the Jackie Robinson era. He admitted that Robinson’s impact on the game of baseball was lost on him at that time (he was only 11) and that because “half” his friends were “Negroes” he didn’t really think about there not being black players in the majors. It wasn’t until he had a conversation with one of his friends that he realized that the only black player at that time was Jackie. He recalled the first time he saw “colored” water fountains and restrooms, while on a trip with his family. He also thought that Jackie wasn’t the best player but was the most exciting he’d ever seen. While reading this article, I was feeling “some kinda way.” Who still uses the word “negroes?” Who doesn’t know how impactful Jackie Robinson’s life and sacrifices were? Then it dawned on me that this is why it was important for this movie to be made, and for MLB to honor Mr. Robinson with his own day each season. Reinsdorf was speaking his truth, and his subsequent enlightenment. What more can we ask for? I would also like to note that Jerry Reinsdorf was the lone dissenting voice last year, among team owners who are trying to do away with pension plans for non-athlete MLB personnel. Way to go, JR! “42” opens nationwide, April 12, 2013.